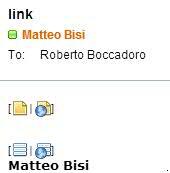 In this period i'm enabling some of new features in our Domino environment with my collegue Roberto. One of new iNotes9 features is the possibility to have doclink in email in Notes format (this is the default) but also in web format. This is could be very useful because we will sure to have all link we send working correctly without have to think where our recipient will read the email (Notes, Browser or Traveler Device). The first link will be the Notes link, the second one the Web Link.